Dr. Suresh Sharma is an assistant professor in Civil and Environmental Engineering Program of Youngstown State University, Ohio. Dr. Sharma worked as a Postdoctoral Research Associate at Purdue University,Indiana for a year after completing his PhD study in Civil Engineering.Dr. Sharma received his PhD (“Incorporating El-Nino Southern Oscillation (ENSO)-Induced Climate Variability for Long-Range Hydrologic Forecast and Stream Water Quality Protection”) from Auburn university, USA. Before Joining PhD, Dr. Sharma worked in Nepal Government as a Civil Engineer being involved in various multi-disciplinary projects such as rural road, bridge, irrigation, water supply and sanitation. Dr. Sharma received his Masters degree in Water Resources Engineering (Civil) in 2005 from the Institute of Engineering, Pulchowk Campus, Nepal, and also received Bachelor degree in Civil Engineering in 2000 from the same university. Dr. Sharma is interested in complex hydrologic and water quality modeling using various types of data driven, conceptual, physically based and distributed and semi-distributed watershed models in climate change/variability context. Currently, Dr. Sharma is working in a research related with hydraulic fracking and its impact on water resources, early flood warning system, sediment and nutrient loading reduction due to bioenergy crop implementation etc. Currently, Dr. Sharma is working in the salinity prediction of the marsh area in the Mentor Ohio. The overall goal of this project is to develop hydrologic and hydrodynamic models and predict salinity variation across the marsh in various locations and seasons, especially by incorporating the tidal influence of Lake Erie with upstream salinity loadings. In addition, Dr. Sharma works in the area of climate variability and its impact on water resources and water quality (NPDES permit and TMDL development, organic carbon simulation) including watershed modelling using various kinds of models/programming tools and technique. Dr. Sharma’s research also includes the application of various climate forcing functions including ENSO, NAO, PDO for TOC load monitoring, long range stream flow forecasting using climate models, climate variability-based rainfall runoff modeling, hydrological time series analysis with ENSO (wavelet analysis) and mathematical modeling for stream flow forecasting with ENSO application. 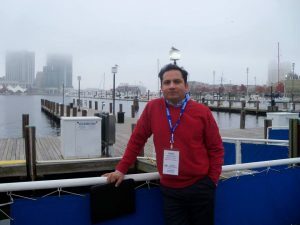 Dr. Sharma has extensive experiences in watershed modeling, hydrodynamic and Instream water quality modeling, river modeling in tidally influenced streams. Some of his research interest includes Nutrient modeling,Non-point source modeling/sediment modeling/DO modeling, best management practices, Sediment transport and anthropogenic influence on nutrient cycle and management. Besides, Dr. Sharma’s research inludes land use/land cover change impact analysis, remotely sensed precipitation datasets (NEXRAD) and its application in hydrology, spatial variability and its impact in hydrologic analysis etc.